Lloyd had choir practice on Friday night, and I had a long list of things to get done, so of course I did none of them. I made something to eat, watched some t.v., and decided to finally put into practice a plan I’ve had for a split bed. As you know, I’ve been sleeping at an angle (for the acid reflux trouble) since… Christmas? and I have to tell you, it’s not that bad having a whole bed to yourself. I love Lloyd and everything, but when we’re all together the cats sleep with me and it gets kinda crowded on my side. However, since the current situation was starting to feel more like we were housemates than spouses, I think I have a prototype. 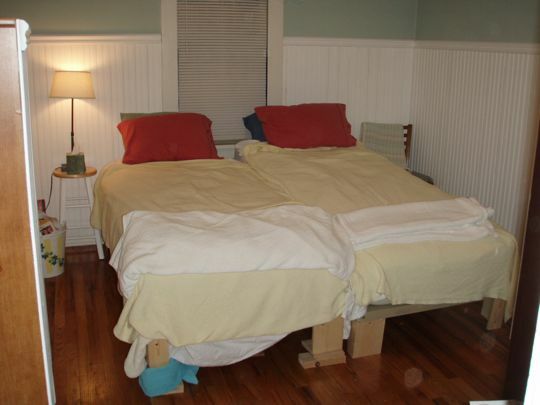 These are the twin beds in the downstairs guest room. Mine is propped up at an with concrete blocks, and Lloyd’s is flat, but has some 2×4 pieces under the legs so that my incline isn’t so noticeable. (My diagram makes it look like the head of his bed is on a block, too. It isn’t – I goofed up the drawing.) It took nearly an hour and a half of finagling to get them just right, and I ripped my shirt crawling around underneath, but I’m pleased with the result. The best part? I’m back in a room with a t.v.! The downside? I messed up – I’m supposed to be on the left. I’m not fixing it. One word: Craftmatic. Or is that two? Being a belly sleeper, I always wondered who would buy a bed where you sat up while you slept. Now I know. That Craftmatic has the same problems as the wedge -- bad for side sleepers (and stomach sleepers). I think the people from Cirque de Soleil would like it, though. So will you be moving permanently to the main floor bedroom and close off your upstairs entirely? Except for when Brad visits, of course. If you do close off the upstairs, perhaps you could put a murphy bed for me in the living room. It’s the perfect excuse to get one! …or build a prototype, as the case may be. And just think of all the heat you would save if you do that!! 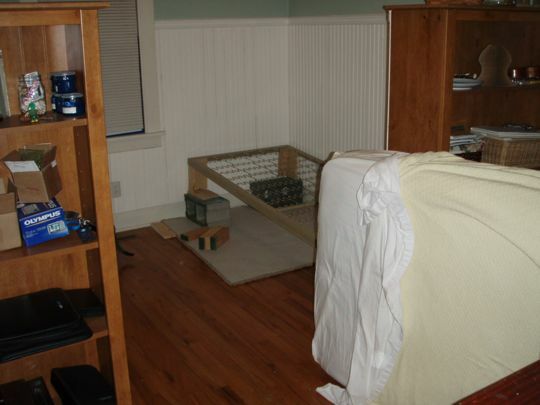 My father-in-law has a murphy bed in the house he grew up in in Italy; the house is like a thousand years old; it’s really just a one room house…Lil Joe slept in that bed & hated it…he said he could feel the ghosts watching him all night. He refused to sleep there a 2nd night. Wow… that’s a lot of work! Any chance you’ll just set that up in your bedroom and then throw the comforter over it to cover it up? Because your bedroom is so cool! Brad, there’s enough space in that room we’ll just put another twin bed in there. It’ll be like camp! Truthfully, I don’t see this (these beds in this room) as a permanent solution, mostly because the bases are old bunk beds that have those wonky S-springs and are way, way too cushy. I need a firmer mattress support than these. I can fix all of that for you for, say, $1,000. That’s what plywood is for.